Pinball, as we know it, is suffering. Suffering from being murdered. Murdered by VIDEO GAMES. Ok, let’s cut the melodrama - It was inevitable, as people stopped frequenting arcades in America to stay home, that pinball would die. A few hardheads and pinball dads still frequent trade shows, restore tables and generally play the machines near them but other than that, pinball just isn’t the same as before. Williams sold its shares in its pin division and its own video game development team in ‘99. Gottlieb folded. All that’s left is Sega Pinball, which is also similarly disbanded until Gary Stern buys the licenses and launches Stern Pinball co. which is still active today. 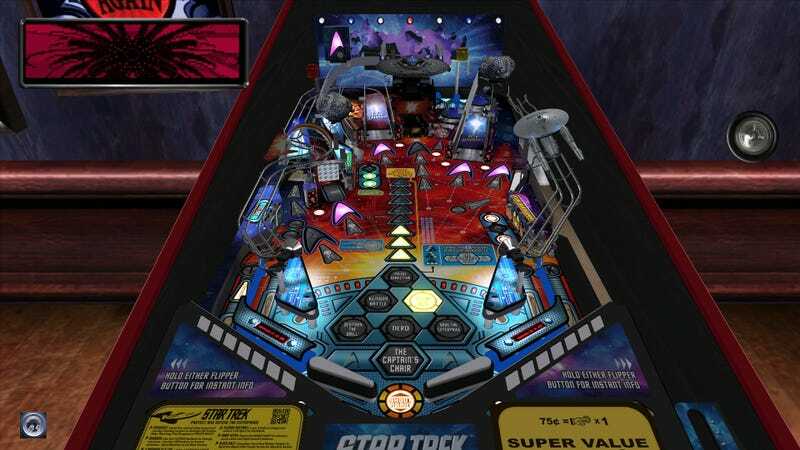 In fact, they are the only ones manufacturing new tables to this very day, and they have entered into a partnership with Farsight Studios to distribute the tables that were on their own pinball arcade client (also developed by Farsight) in Pinball Arcade proper. Also note that I do not talk about Zen Studios not because they aren’t important in the pinball world, but rather because they do not develop physical tables. Nowadays, tables must have a license. Original tables simply do not sell unless they’re in a video game itself, Even then, that’s debatable. There are a total of 8 tables in Pinball Arcade at this point in time - High Roller Casino, Ripley’s Believe It or Not!, Harley-Davidson 3rd Edition, AC/DC, Star Trek, Mustang, Doctor Who: Master of Time and Ghostbusters Premium. High Roller Casino is the only original table in the entire roster that isn’t licensed to some degree, and there’s just not much to say about it. There’s a spinning roulette which is involved with the skillshot. The goal is simple - go through all the games so you can activate the feature of the table and score big. The table itself works kind of fine and it’s pretty difficult to screw up a shot. Ripley’s Believe It! or Not has been part of Pinball Arcade for a while now, having been released as part of the original launch tables and while it’s a fun table, I couldn’t help but raise an eyebrow at the talking shrunken head with a jamaican accent and the overall silliness of the table. I’m not as familiar with the source material as some of the other tables but I’m fairly certain that rollerskating penguins were not part of it. The third flipper, at around mid-table, can lead to eternal loops if a player is playing perfectly, bumping Penguin Jackpots to an extremely high amount. Farsight Studios advertises that Mustang uses an actual gear change lever to launch the ball, which is to say that there’s not a lot to say about the table. They also advertise the hell out of the Mustang and its history, but nothing to mention about the actual table. That’s because Mustang is boring. There’s a few Multiball setups and some features, but there’s nothing much to say about the table in question. In fact “nothing much to say about the table in question” is clearly the chief operating motto at Stern today. Don’t rock the boat, create tables that our old pinball dads can play, and never innovate. You had/have some of the minds that created the most innovative pinball tables in Steve Richie and John Borg, and at best they come up with some serviceable tables that don’t even come close to the innovation and fun of their previous work. And nowhere is that more prevalent than the AC/DC table. A premium table that actually cost more than the rest on the Stern Pinball Arcade app due to all the licenses (the AC/DC name and the variety of songs alone, as well as the likenesses of band members) necessary for its function, this table had everything to become legendary. Sensible design that matched the theme as well as bombastic sound direction that included actual AC/DC tracks instead of your typical pinball electrofart. In practice, it’s... not that. Here’s my personal problem with it - Two of the features of the table have led to extremely rapid drains which I could not do anything about. We’re talking dead center drains, or hitting a target to bounce right in the outlanes. Playing this table means knowing how to gently nudge the table and more importantly how to do it fast enough to save the ball... and trust me, it’s a lot hard to do on the actual table than on a controller in the emulator. That being said, the table itself has fantastic design. The fact that whichever song is playing gives bonus points to a certain part of the table is genius - It’s in the execution of the table that I find my problems. The TNT targets led to drains in the left outlane or a center one that required a nudge to save (and at certain speed the nudge may just tilt the machine) something like 80% of the time, enough that I wanted to avoid it at all costs. Same thing with the cannon feature, which is central to a lot of the game’s features. You use this to fire the cannon that’ll kill your ball. There are two problems with the cannon feature on AC/DC. First is that it completely covers the right lanes. It’s impossible to see properly, so if you need to nudge, you might be nudging in the wrong direction. The second is that the cannon itself requires to hit a target that’s directly going to bounce the ball back towards the right lanes... which you can’t see where you’re headed. Another thing that you won’t notice playing the table through an emulator rather than the actual table. On the actual table, there’s a Fire! button that fires the cannon or automatically fires off the ball if you’re just starting. NEVER USE IT TO INITIATE PLAY. You cannot actually do the skill shot which gradually increases as you nail it, and it is painfully easy since you just need to guess whether it’s A X or E that the ball will fall through and the ball will typically be very visible as to where it falls. The actual table has problems that Farsight did not actually emulate correctly, much to their credit. Which is the only credit I’m willing to give them for these tables. Out of AC/DC, Star Trek and Mustang, not a single one of them ran smoothly throughout my attempts at playing them, often having hitches when other tables ran flawlessly. This isn’t exactly unknown for Farsight to have tons of issues, but it’s rare that the tables themselves have problems (beyond one or two I’ve encountered that somehow managed to have the ball clip through the playfield). This leaves us with one more table to talk about because it’s... bizarre. Farsight Studios, having the license for Dr. Who but not the rights to the table at the time (Which they lost on June 30th of this year), attempted a modernized version of the table called Doctor Who: Master of Time. It... doesn’t play as well as the original. Centering mainly on the newer season and the companions of that, they didn’t capture the magic of the original and it shows. It suffers from the same comparison that No Good Gofers suffers from: Why play Master of Time when you can play the original? At least here, if you can’t play the original, you have a semblance of equivalence? Still, It’s a good argument for Farsight themselves not making new tables for their own app and sticking to recreations. Leave the original tables to Zen Studios, please. And that is the end of our journey through Farsight Studios’ Pinball Arcade... and the end (for me) of the SixTAY Days of Writing. I’ll do a wrap-up post tomorrow for that, but all in all, I enjoyed my experience, and I ended up playing with a lot more balls than I ever expected to play in my entire goddamn life.